Inspiration board for a gray, white and pink nursery for a baby girl in an elephant and polka dots theme. This cute pink and gray baby girl's nursery has the colors and the elephant theme that her mom wanted for her daughter's first room. In the planning stages, Mom said that she loved the look of a gray and pink combination but that her husband wanted the nursery decorated in an elephant theme. A light gray color paint has been chosen for the nursery walls that matched the gray polka dots of the baby bedding set very nicely. We chose a lighter shade to provide a nice contrast with the crib quilt that will be used as a wall hanging that is in the same color family. The quilt will have to be hung higher on the wall than it appears in the picture for safety reasons, of course. If you love the crib set, you can get it here and it would be a good idea to hurry before it's sold out; it's beautiful and very cheap for such a nice set! Plus, you get a fitted sheet, the crib quilt, a pink, gray and white window valance, the crib skirt and a security blanket. A matching valance comes with the crib set but as you can see I am playing with the idea of either embellishing the curtains with pink pom poms or creating a nursery ceiling mobile made from tissue paper pom poms. As soon as we found the baby bedding set with pink and gray polka dots, I went straight to work to find the perfect chair. I envisioned something soft and comfortable in charcoal gray but Mom liked the idea of this gray chair that has an easy to clean, wipeable surface. Next to the chair, there's a small table where a lamp (to be decided) will be. The fluffy area rug softens the look of the pickled wood floors as well as the acoustics in the room. Please make plans to visit Unique Baby Gear Ideas often to see more nursery theme ideas for a girl with examples of rooms decorated in pink and gray as well as other colors. 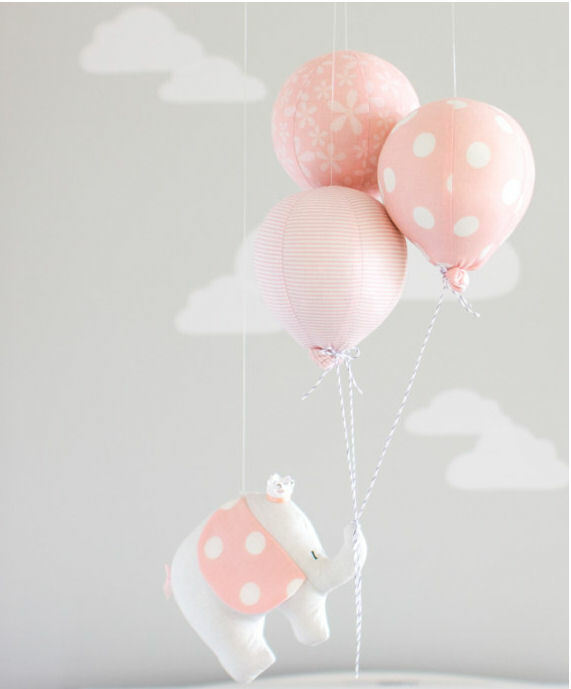 I found the perfect elephant baby mobile for this pink and grey nursery. The colors of the fabrics are softer and more subtle than the hot pink of the paper pom poms over the windows but they are actually more to my liking. It is made by Sunshine and Vodka and I just adore it, don't you? It would be pretty in other pink and grey baby girl nurseries, too.